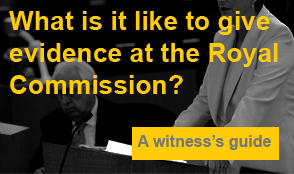 The Commonwealth Government pays the victim’s chosen lawyer to represent clients who are called to be public witnesses at the Royal Commission. This process doesn’t cost victims a thing. The Government pays for all of the time that Kelso’s lawyers spend working on clients’ statements, and our other expenses like travel and accommodation. What about fees for achieving compensation? We do charge clients for the work Peter and the team do outside of the Royal Commission in order to achieve compensation payments for them. But the way we charge is different. We do this work on a no-win, no-fee basis. You will only pay Kelso’s when you receive compensation, and we charge on a sliding scale, so that clients who receive large awards pay more in costs than those who receive small payouts. We think it’s fairer that way. Since 1988, when we started to help victims of abuse achieve fair compensation, we have never had any client complain about our fees. Traditionally, lawyers charge on a time basis, which means clients pay for every minute they are travelling, on the phone or reading a letter. We don’t like this approach, as it means clients who receive relatively small payouts risk having their award swallowed up by their lawyer’s fees. We have carefully structured our fees to make sure we never receive a greater proportion of a payout than our client does. The other thing we don’t like about lawyers charging on a time basis is that there is also no incentive for them to complete the case quickly. We know that digging up the past can leave our clients feeling really disturbed. My client’s wellbeing is important to me, so once I take a case on, I aim to achieve an apology and a lump sum payment in the shortest possible time. Many lawyers tend to cherry-pick cases that are likely to achieve big payouts, but we don’t want to turn away anyone who was abused as a child. We also want to make sure that every case – including small claims – receives as much time and attention as they need. We ask all of our clients to sign a cost agreement, so everyone is clear on the fees before we start work. As soon as that is done, we can start working on your claim, giving you the best possible chance to take action against your abuser and their institution. The Royal Commission is continuing to gain momentum, with public pressure mounting on the institutions involved. Your evidence could change your life, and the lives of so many others. If you’re ready to share your story, make sure you get in touch with Peter and our team. You can rest assured that you won’t have any financial burden to worry about.